This pattern was first published in Vogue Knitting in the Fall of 1991. It was then re-published in the magazine’s 25th anniversary year, Fall of 2007. I loved the bold contrasting colors when I first saw it and loved it all over again when it re-surfaced. When I saw The Missoni Challenge 2018 offered on Ravelry, it was game on and having a pretty healthy remnant stash of DK weight only added to the impetus. I am highlighting the band in particular due to its tricky installation as well as appreciating its dramatic impact to the design of the garment. 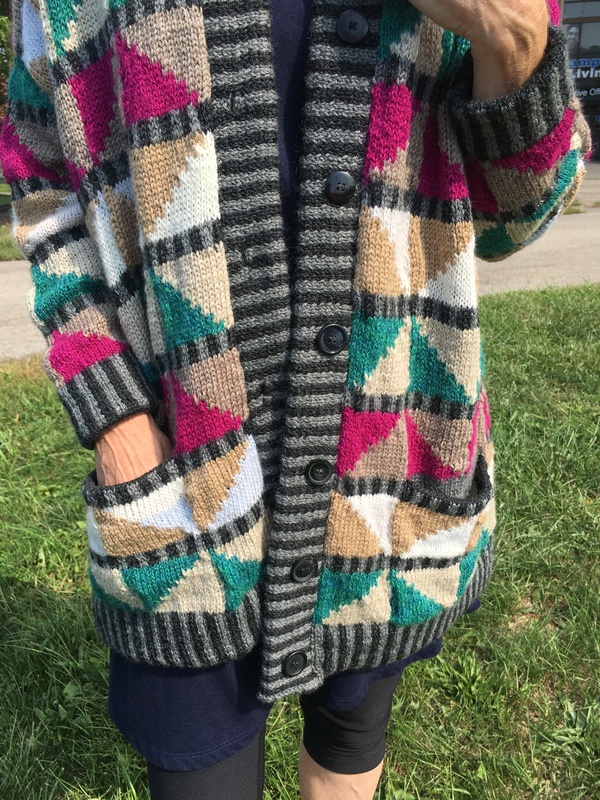 Elements of Design: oversized hooded cardigan jacket with bold geometric pattern using knitting skills of intarsia (color block with bobbins) with fair isle banding. Sewing skills needed for pockets, hems and band linings.